= My current boyfriend could be a bad choice..
We use it often for a quiz show or game. ★当たり！ = あたり! = アタリ! =You are right! Bingo! ★外れ！= はずれ! = ハズレ!= Your guess (answer) is not right! You made a mistake! Note: When someone won a big prize or guess something difficult correctly, we say 大当たり= ooatari! A :「マギーの好きな食べ物は何でしょう！」= Maggie no sukina tabemono wa nandeshou! = Guess what Maggie’s favorite food is! B :「ステーキ?」= suteiki! = Steak? D :「当たり！」 = Atari! = Bingo! We often use it when we eat food. Sometimes we use it figuratively like in the picture above. Which means, Maggie wonders if she made a bad choice or picked the wrong boyfriend = ハズレ= hazure! = kenshou de Hawai ryokou ni ataru. = failed one’s speculation for the exam. To understand this one, first you should also know the idiom 山(ヤマ)をかける = yama wo kakeru = to study only one area of material that you think will appear on a test because you don’t have time to study everything. オマケ！ = Omake =Bonus Video Lesson! I once used 紙兎ロペ = Kamiusagi Rope = Paper Rabbit Rope’s video for 若者言葉 レッスン= Wakamono Kotoba Lesson = Young People’s Japanese lesson. 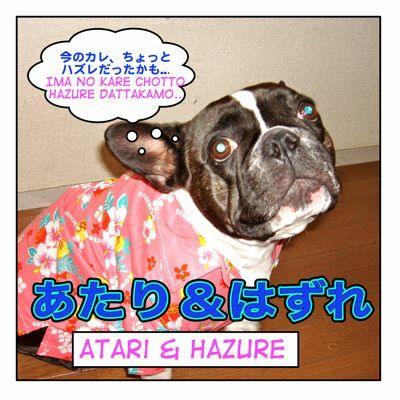 atari hazure, so please pay attention to it. The way they talk is very vulgar and it is full of slangy expressions. So I will teach you this but please be careful when you use these expressions. Only use them in situations and with people who you are sure you won’t offend. This clip is interesting because you can see the contrast between the way young people talk and the way old people talk. Note : アキラ ( =Akira) is older than ロペ ( = Rope) he is called 先輩 ( = senpai) senior. Note : ガチャガチャ = gachagacha = is a clatter sound. It is also the name of a machine from which you buy little toys in a capsule. In this episode, Rope and Akira will visit a little store called 小島商店 = Kojima shouten to buy “Ultra Ball”, a type of bouncy ball with this Gachagacha machine. Open the video in a separate window and read along with the text. •超はねる！= chou haneru = Super bouncing! 超 = chou = “super” , add it before a word to emphasize its meaning. • ウルトラボール = “Ultra Ball” a name of a bouncy ball. Supposedly it bounces more than Super Ball according to Akira. • 超はねる！= chou haneru = super bouncing! = Kono shouhin wa atari hazure ga ari mihon igai ga kyuujuuhappasento haitte imasu. = There are good ones and bad ones among these products . There is a 98 pct chance that you’ll pick a different ball from the samples shown. Note: It is a funny joke line that you will never see in real life. It means you don’t always get a good one. Sometimes you get a bad one or one that you may not particularly like. = N? O, sugee urutora bouru da! Waa suggee! = Umm? Oh wow! Awesome! Ultra Balls! Awesome! 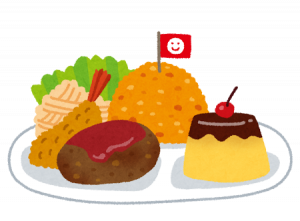 •すげ〜= sugee すっげえ = suggee= Great! Awesome!（vulgar) ← すごい= sugoi. Mainly used by young men. •なんすか = nansuka ← なんですか？= nandesuka? =What is it? •どお.. = doo …Young people tend to stretch the end of a sentence. = There are Super Balls, right? = Nanka, suupaa bouru no tashika sanjuubai toka haneru rashin dawa. = They say it bounces 30 times more than Super Balls. マジっすか？ = Majissuka? ←マジですか？ = Majidesuka? っすか =ssuka? or っすか？= ssuka? instead of ですか？= desuka? •ヤバい(イ）= yabai = (slang), you can use both negatively or positively. →positive : good, great, delicious, awesome. ~くね = kune? (vulgar ending)　used with i-adjective. •ヤバくね？ = yabakune? ← ヤバくない？= Yabakunai? Ex. 美味しくない？= OIshikunai? = Isn’t it delicious? → 美味しくね？= Oishiku ne? Ex. 高くない？ = Kawaiku nai? = Isn’t it expensive? → 高くね？= Takaku ne? •だべ = dabe ← (そう）でしょ？= (Sou) desho? だべ = dabe is an ending originally from a dialect of Tohoku area. Ex. そうだべ？ = soudabe? ← そうでしょ？= soudesho? = Cho, ore ikkai yaruwa, kore. = Well, I will try this once. = Tsuuka urutorabouru nyuuka suru toka saa..
= Chotto hisabisa ni aredawa. Hayashishouten minaoshitawa. = You know I now see Hayashi Shoten in a different light. = Oo.. Oo! deta! Yosshaa! = Yeah… Oh! It came out! Goodie! •よっしゃあ〜！= Yosshaa! = Yay! Goodie! Great! I got it! I made it! We say this when we achieve something or are happy. Like やったー！= Yattaa! = Yay! = What? What is this? = Eee. Ore ima kore urutora bouru no yatu yatta yonaa. = Umm? I just did the one with Ultra balls, right? = Eeeeeh! Ossan,! Ossan! Are!? Ossaan!! = Whaaat!? Old man! Old man! What? Old man!! = Yeah, yeah, yeah… Well! What’s the commotion? You guys are so loud! •なんじゃ = nanja! a kind of corny way of old man’s talk ← なんだ = nanda! = Iyaiya souzoushii janeeyo. Majide! Kore douiu kotodayo! Naa! = No, no… Don’t tell me we are loud. I am serious! What do you mean by this? Hey! = Kore omae, okosama ranchi no ano pirafu no ue ni sasatte yatsu daro, kore! Naa! = This is the thing stuck on top of the children’s lunch plate rice, isn’t it. Hey! •お子様ランチ = okosama ranchi = typical lunch plate for children. Usually they stick a paper flag made with a toothpick on top of the rice. = Akiraka ni koko sasatteta ato ga tuiterusshii. = Obviously there is a mark to prove it was stuck here. = Jibun no omoidoori ni naran koto mo arujaroga! = Things don’t always go the way you like. = can’t be like as you had expected. •あるじゃろが！= aru jaro ga (old man’s talk / old fashioned) ←あるだろうが! ＝ Aru darou ga! = Atari hazure ga aru no ga jinsei no daigomi ja nainkaa! Soujarou! = Winning and losing is part of the fun of life right? = What the hell are you talking about? = Chigeeyo, dattara kono urutorabouru no garaga chigee to ka ookisa ga doutoka souiu atarihazure wa iikdoe kore hansoku daro! = That is not true. It is OK to pick a winning or losing design or a big or small ultra ball but this is wrong! •ちげーよ = chigeeyo (vulgar) ← ちがうよ = chigauyo = It is not true. = When I was a kid, I would have been thrilled. Children in this modern days are… you know video games, etc. = Ikura ossan ga kodomono toki demo yoo, kono igirisiu kokki wa needaroo! = Even in your childhood, there is no way you’d have gotten this British flag..
= Kimi wa igirisu suki ka? = Do you like England? = Kimiwa igirisu ga sukika to kiitorunja! = I am asking you if you like England or not. •聞いとるんじゃ！ = kiitorunja! ← 聞いているんだ! = Kiite irunda! じゃ = ja ending is used by old people or in old time stories. You might have seen it in manga an old guru says, そうじゃ = souja = You are right. It is correct!, なんじゃ = nanja? = What is it?, etc. = Aa maa sukiccha suki kanaa.. sakka tsueeshi. •好きっちゃ好きかな= sukiccha suki kana ← 好きかと聞かれたら（言われたら）好きかな = suki kato kiaretara (iwaretara) suki kana.. = If you ask me whether I like it or not, I would say I like it. •よかったのう = Yokatta nou ← よかったね = Yokatta ne. Old old people end the sentence with のう = nou. そっか = sokka is a colloquial expression of そうか = souka so it is funny that this old guy uses both young people and old people languages. = Aa.. iyaiya yokuneeyo. Abune! Nanka guchaguchatto sareru tokoro datta. Ossan! Oi! = Um… No, no… It’s not good! Man, that was close. Oh my. I was almost trapped. Old man! Oi! = Senpai, mou hottoite eigakan ikimashouyo! = Senpai, let’s leave it and go to the movie theater! = Watashi ateru no jouzu nandayo. Mite, Mite! = I am good at guessing, Look! Look! I just spent the last 15 minutes bursting out in laughter thanks to you. Great video. It’s great to see proper, slang Japanese, which is so damn difficult to find. Thank you for visiting this site! I love the video as well! Did you check my other lesson 若者言葉 ? If not, please check it. I taught the same series. You’re welcome! I enjoyed making the lesson,too!